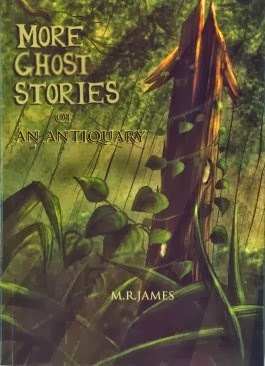 After last year's mostly pleasant Ghost Stories of an Antiquary, it is time for M.R. James' second set. A teacher asks his students to write down a Latin phrase. When he collects them he finds that one of the students has written down something disturbing. 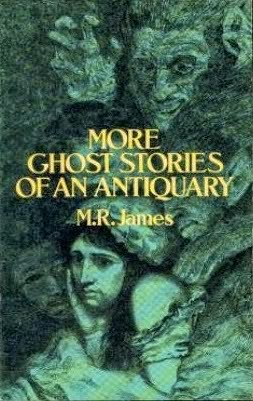 Even though this one has a bit of a standard horror progression, provides solid thrills and ruminates on how ghost stories are spread. The story is told mostly in Gatsby-esque style by the best friend of the creepy student. Unlike The Lost Stradivarius, the point of view and frame story allow just enough to be seen to not spoil elements of the story. A woman is having trouble when a post is discovered in her garden. She soon finds that it has lead to people having visions of being put on trial for their lives. This story is the first of this set to mistake trials for being scary. Mastigophobiacs beware, I guess. That's the fear of being punished, which is the closest I could come to finding someone to be afraid of this, perhaps it was more common back then. This one achieves strange, but doesn't make it even close to scary. A man stumbles into a library searching for a book. The clerk apologies and says an old man checked it out earlier, but it should be back the next day. The following day, when the young man goes to check for the book, sees the old man close up and faints of fright. Half horror and half drama, this story manages both well. The young clerk is drawn into a feud between siblings and that plot builds to a race to the finish with a horrific end to the tale. A man rejects the paper proposal of an old alchemist. He thinks nothing of it until he learns of the death of another man. Soon the man notices some strange things happening around him. A dash of horror and a bit of adventure combine to make this tale rather entertaining. Most horror stories involve unstobable forces as this one does, but it proves just how fickle they can be. A man runs across the obituary of an old Archdeacon, which strikes him as odd. Later, at his job, he finds of the diary of the Archdeacon and learns of the strange occurrences surrounding some engravings he recieves. While there are some great moments, the atmosphere of this tale just doesn't hold up. The archdeacon's death is 'spooky' in all the wrong ways. A section of land is brought to the attention of a man. He goes around asking about its namesake and hears the tale of the trial of George Martin, the murderer who's buried there. Another one for the mastigophobiacs. The trial is too formal to provide any atmosphere and the scares on their own are middling at best. This is the tale of a douche who got what was coming to him. Mr. Humphires inherits an estate from his dead uncle. He soon finds an old maze on the property that his uncle had locked up. Is there more to the maze than it seems? Close, but not quite enough. After an eternity of uninteresting build up and an almost good turnaround, this story just end on what probably should have been the middle. Mazes are awesome and, unlike trials, are actually scary; however, this story is left with only a few good ideas and a lot of dull characters and action. More Ghost Stories continues in the style of the first, though the successes are due more to clever genre mixing than straight horror. 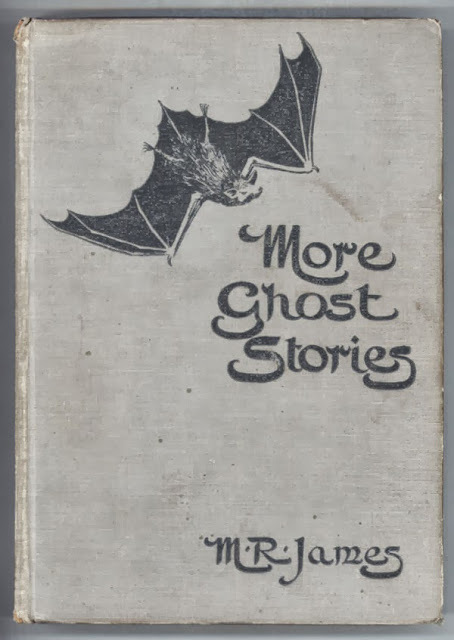 In fact, most of these stories have only elements of horror. Read the best of them if you enjoyed the first set. Read it for free on Project Gutenberg and on Kindle!